Got me in the mood to make more lentil dishes. Shiitake mushrooms look really creepy raw, but they're very good once cooked. 1. In a mini food processor, combine the garlic, jalapeños and ginger and process to a paste. I don't have a mini food processor so instead I grated the garlic, jalapenos and ginger to a paste. 2. In a large nonstick skillet, heat the oil. Add the onions and cook over moderately high heat until sizzling, about 3 minutes. Reduce the heat to moderate and cook, stirring occasionally, until the onions are browned, about 7 minutes. Add the garlic paste and cook, stirring, until fragrant, about 2 minutes. Add the cumin, coriander and cayenne and cook, stirring, for 1 minute. Add the tomatoes and simmer over moderate heat until thickened, about 6 minutes. Add the chickpeas and water and simmer until the chickpeas are flavored with the gravy, about 8 minutes. Season the chickpeas with salt, garnish with the cilantro and serve. My recipe came out a little more soupy than the F&W photos. Next time consider draining to diced tomatoes. Great appetizer or side dish served with any variation of pita bread. A culinary trick on words for green eggs and ham can be found below. Original recipe courtesy of Food Network Channel's Rachael Ray. * 1 (10-ounce) box frozen chopped spinach, defrosted in microwave & liquids drained. Fresh 10-ounce fresh salad bag of spinach works just as well. In a medium skillet over medium heat, heat the extra-virgin olive oil and the butter and sweat the shallots a few minutes. Add the spinach and stir in the cream, season with salt, freshly ground black pepper and a little grated nutmeg. Cook the spinach, stirring occasionally, until the cream has thickened, 5 minutes. Adjust seasoning to your taste. Fold each slice of ham or prosciutto in half and line the nonstick cups with 1 slice of meat each. 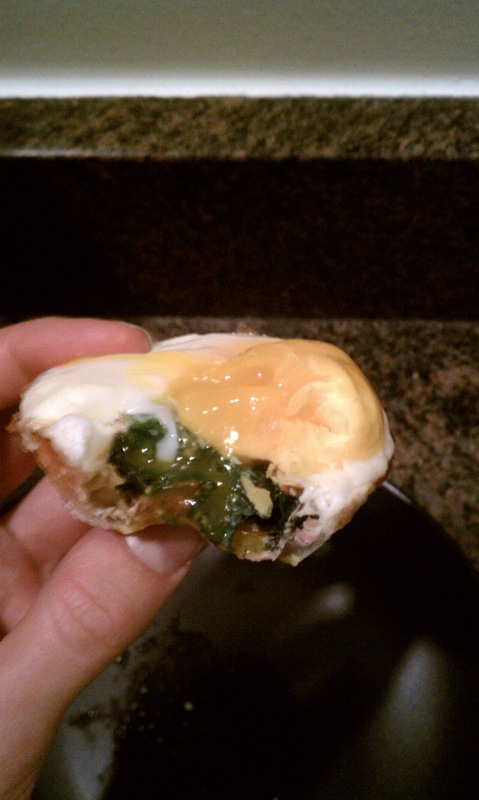 Spoon a heaping tablespoon of the cooked spinach into each of the cups, then crack an egg into each, making sure it stays whole (hint - if you're worried about breaking the egg yolk, crack the egg into a small bowl first, then pour it into the muffin cup). Season the tops of the eggs with salt and freshly ground black pepper and bake in the oven until set, about 15 minutes. 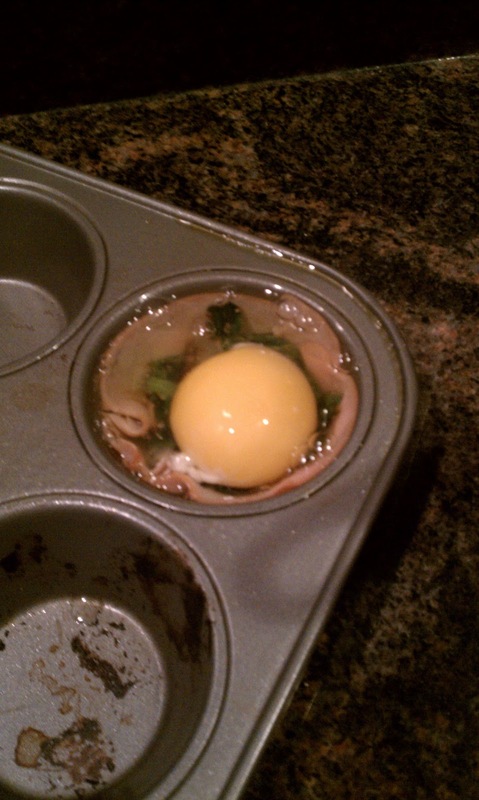 Allow the baked eggs to cool in the muffin cups for a couple of minutes before removing them from the pan. Serve immediately. Make sure to fold over or double layer the ham.